Bob is co-founder of Fults Commercial Real Estate. With more than 20 years of brokerage experience in Dallas, Bob is very knowledgeable of the market and adept in successfully negotiating office transactions on behalf of investors and owners. Primarily focused on the landlord side of transactions, Bob possesses significant insight and experience in value enhancement and preservation on behalf of the owner. 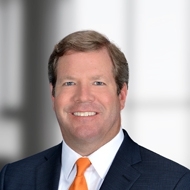 Prior to joining Fults Commercial, Mr. Buell was responsible for the overall marketing and leasing of 6 million square feet of commercial office properties owned and developed by Equity Office, formerly CarrAmerica Realty Corporation, as well as third party clients in the Central Region of the United States. While at Equity Office, Bob successfully negotiated millions of square feet of office transactions in the Dallas, Austin, Denver,and Chicago markets. Before joining Equity Office, Bob worked at Wilcox Realty Group as Vice President. There, his responsibilities included the leasing and marketing of office buildings on behalf of third party clients. Mr. Buell successfully pre-leased several major office developments as well as participated in the design and implantation of marketing strategies for multiple office buildings. Bob’s career began in real estate research, where he quickly moved into industrial and ultimately gravitated to premier office projects. Born and raised in Dallas, Bob is a graduate of Spring Hill College in Mobile, Alabama with a Bachelor of Science Degree in Finance & Economics. He currently resides in Dallas and is married to Sarah and has 3 children, Bobby Jr., Thurman, and Rebecca. During his career, Bob has completed over 450 lease transactions totaling more than 5 million square feet.